Jeanne Hamers-van der Werff, President of Quiltersgilde, does a jig with Gary Walker, organizer and host. featuring quilts from abroad would also cease. Three years running, quilts from Russia, Kenya, and Ireland had been imported and festively displayed for all to enjoy. A local committee formed and went to work. A connection with a Dutch quilting guild was made and during the week of May 23 – 28th, 137 Dutch quilts of varying shapes and sizes arrived for the fourth annual festival. The quilters also came. On Sunday, residents saluted the Dutch visitors with over 100 quilts airing on porches and clotheslines throughout the village. Tables groaning with a pot luck buffet fed 125 people packed into Ye Olde Towne Hall. On Monday, the first day of the Festival, five hundred people visited the exhibition hung in the Ailsa Craig Recreation Centre. On Monday evening, a gala was held at the Recreation Centre with over 50 Festival Supporters in attendance. 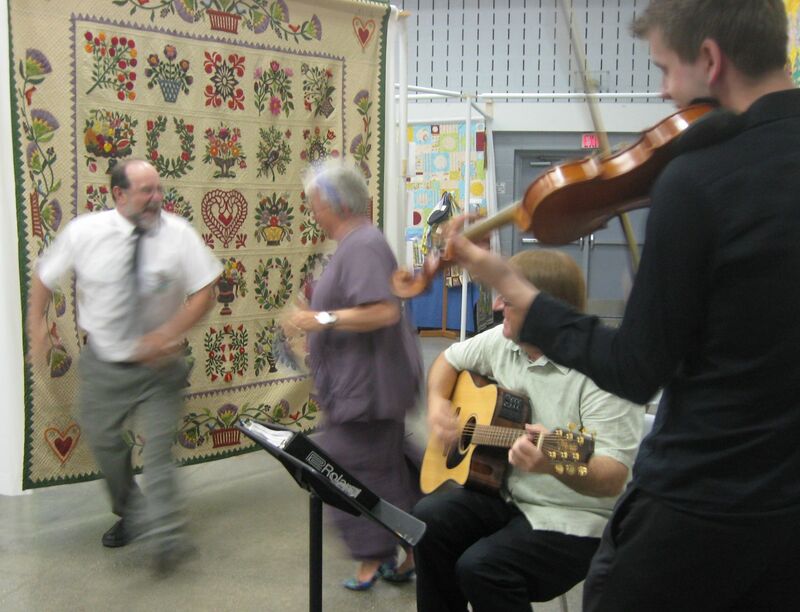 Events are scheduled all week http://www.ailsacraigquiltfestival.org/, providing a rural complement to the Quilt Ontario event May 24 – 28th at University of Western Ontario in London. A planned bus trip to Wardsville May 25th was cancelled due to the over abundance of activities. Posted on May 30, 2011, in Barn Quilt Champions., Supporters & Sponsors. and tagged Ailsa Craig, Ailsa Craig Community Quilt Festival. Bookmark the permalink. Leave a comment.